While it may be a small town, Perry has had its fair share of historic events and famous residents. Bringing together photos and historical documents from Hometown Heritage's collection, images from the Dexter Museum, and artifacts from Forest Park Museum, this exhibit tells the story of a few of these noteworthy events and people. Learn about the most famous patient in Perry's first hospital, the gangster and member of Bonnie & Clyde's gang, Buck Barrow. See photos from the two occasions that baseball legend Babe Ruth played ball in Dallas County. 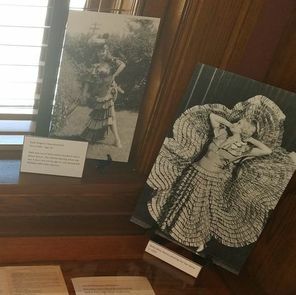 Hear about the glamorous Betty Mae Harris, an Iowa girl who made it big performing vaudeville on Broadway before teaching hundreds of Perry and Boone students how to dance. And read the comics and see the high school sketches of Snick Hamlin, a Perry native who became known throughout the United States for his time-traveling caveman, Alley Oop.